"I will sing for all the saints!" He'll bundle up in thermal underwear and a long coat and gloves. It will remind you that he needs a hat. You give him your best Allen Eagle ball cap to wear. On the way to the game, he will need to eat some dinner. So you'll stop and have Chick Fil A for a sandwich. He'll ask for a seat on the 50-yard line. You'll find one on the first row. he'll want to watch his great-granddaughter cheer on the mascot. But only in between plays. the living daylights out of the other team. and he'll remember to tell the rest of us about how big the band was and about Katie playing with the mascot, Big Boy. you'll be taking him to the playoffs. Miss Katie and I went to the Lutheran church with my dear friend, Peggy, this morning. Each Wednesday, we meet there for Katie to sing with the children's choir and to learn handbells. She loves it. I love it. That means she spends time with friends and I do too. And who says only one church is enough? (We attend the Methodist church on most Sundays). Today was All Saints Day, and the children's choir sang with the adult choir. But it was especially sweet that Peggy's daughter, Samantha, was remembered today. We walked in the church to find her chair cloth, and her momma found her right at the front of the church. Peggy said Sam always wanted to sit up front, and that silly girl made sure she was sitting up front today. The little choir was seated in the row next to us, and I peeked over at Katie. She whispered, "I will sing for all the saints!" Yes, sweet girl, you will. And even though you don't understand what that means today, your voice will be precious, and I'm so glad we're here. You sang for Sam. And for Peggy, Perry, and Daniel. And the Heavens heard your bells ring. And I believe a pretty little blonde-haired girl smiled down on us today. Little Miss activates every creative bone in her body. Like little striped kitty finger puppets. And glue stick covers. And she uses my vintage books for inspiration and ideas. She got a double whammy of creative genes, I like to think. Every year, my grandmother's family meets for a giant reunion that is unlike most, I think. They are the kindest, most loving family and we all have such a great time. This September we camped in cabins and ate barbecue that was catered, and had breakfast outside under trees with kids playing in dirt and dogs chasing each other in grassy fields, and adults in lawn chairs eating and talking until the sun went down. We have an auction each year to fund the next year's activities, and everyone either makes something or brings something to donate. John Deere caps, sweatshirts, games for the kids, baked goodies, and all kinds of treasures were lined up with big bows on top. I only saw one thing. Well, ok, I saw a few, but one that I wanted. I mean, really wanted. A recipe box. This one, in particular. It had a pink raffia bow and this note on top. That would be my great grandma, and the note written in my grandmother's handwriting. I wanted this box and its contents. So when it was up on the block, my cousin held it up high and told us about it, and asked my grandma how full it was, and she replied, "Oh, it's only about half full." I knew that was wrong. Oh, yes I did. I bid $20, and the next thing I knew, it was up to $50, and my mom took over, and my aunt was running right along with her, until my mom turned around and told her she was bidding against her niece...and she quickly backed off (love that auntie of mine). And mom finished off the auction and won the box for $70. And I cried. Because I knew she did it for me, and she knew how bad I wanted that. Quite some time ago my grandma had given me her Searchlight Cookbook. So it was only perfect that I had these to go with it. My grandma and I have that in common. We cook with cookbooks only sometimes...the rest of the time we read them. That's one of the top ten things I love to read. Cookbooks. Especially old ones. Especially family ones that have been written in and dog-eared and spilled on and cooked with. Here is a peek at the inside...oh, yeah, grandma, you were right. Half full. Haha. I was given a mission to find a special cookie recipe for that sweet aunt of mine. No problem. It might take a little while, but I'll find it... oh, probably around Christmastime. I wonder if my grandma knew that when she brought this, who it would go to? I bet in the back of her mind she did. Don't you? Well, after the fun of digging through all of those nostalgic and sparkly treasures we found in the chair, I took it upon myself to figure out who these pieces belong to and to find out how to return them. There was no way of knowing who donated the chair at the thrift shop. They hand out receipts but don't take your name. The only information I had was that it had been delivered locally and that there were initials and a wedding date in the wedding ring. You would be surprised what you can find, just by googling that little bit. Try it. I found both his and his wife's obituaries. Where they are buried. I found the house they lived in. I found out their children's names. I found out where their family lives now. I found out that he was a Mason, a Shriner, and a WWII vet that worked on ships. So, I talked a good friend in to go on an adventure the next day, to the house that I had found...where the chair came from...where the man and his wife lived...Nettie won't go on adventures with me anymore. Ha. We pulled up and she offered to follow me in for support. The garage door was open. The man inside was on his phone. A motorcycle was parked and there some boxes in there with him. I told him that I had bought the chair. That's it. That I wanted to find it's owner. I rattled off some names of family members and the man himself. I also asked about grandchildren. I told him I wanted to return the chair. I thought the family might want it. He said he was an ex-boyfriend of their secretary. No lie. That he was there to pack it all up and drive it back to the family. He asked if we wanted to look through what was left and take what we wanted. We shook our heads...but then he said craft stuff upstairs. Oh, no. You don't say "craft" and "free" in the same sentence to two crafty teachers. In we went. We shouldn't have. He took us upstairs and continued to point out things he was going to donate, and hand us things calling them "cool" and please take them. Um. No. But there were a few neat retro boxes in there. Shame on me. We got kind of nervous and told him we didn't really want anything, that we would just leave the chair on the porch and send it back. He told us the grandson had moved into the house and let his dog trash the place, and took his grandmother for granted. Then he showed us some random picture on his phone of the beach, I think? I can't remember. At that point I decided the search was over. We thanked him for his time. I don't think he cared one bit to have the chair. He said he remembered it. But it he was doing the work, wouldn't he for sure remember dropping it off a day earlier? And he didn't look inside? He didn't have any regard for any sentimental value at all. So I never told him there was a jewelry box inside. We didn't give him our names or tell him where we were from. He said he was leaving on Friday as we walked out. He had just been laid off from work and was going back to where he came from. Random. Weird, to say the least. Scary, now. We got in the car and drove off. I have the jewelry box. I sent a message to who I think is a granddaughter, but that has been weeks now. No reply. It's ok. I'll enjoy it for them. Katie likes to dig through it and look at all the pretties. I have no idea what it's worth and I'm not sure I really care. I'll keep his memories for his kids that don't want them. And I won't go on any more family tree adventures either. You know what a butler's chair is, right? The chair that used to sit at the door of a home and greeted the gentleman as he came in. It was a hanger for his coat, a tray for his wallet, keys, and pocket change, and it stored his shoes, hiding them underneath. I found a butler's chair from the mid-century years at the thrift shop not too long ago. What I didn't realize was that the seat hinges open for storage, and I assumed it was for shoe polish and brushes and such to keep shoes shiny and professional for the suit that was paired with them. When I carried the seat to the car, I noticed the hinges, and realized it opened, so I peeked inside and saw a few brushes and some shoe horns. No big deal...but maybe they would be fun to dig through. I enjoy old advertisement on merchandise and items like that. So I drove home and decided to dig later when William was there to enjoy too. Yes. Jewelry box. The stain on the outside of the box was a rich patina and has some sort of emblem on it. We opened it up. It was full of jewelry. Tie tacks. Cuff links. Pins. Wedding ring. His wedding ring. Engraved on the inside with his initials and his bride's, and their wedding date. Masonic and Shriner pieces from years ago. Rings. The box was full. Of precious metals and stones. At first it was shock, with all the gold and silver and gems, and then it was a story unfolding, of what his life was about, who he married, where he served, what he wore to work and what he used to keep his tie out of his lunch and his shirt sleeves neatly buttoned. But, why did the family not look in the seat? Maybe they didn't know it opened either? And the chair was tossed aside so the house could be packed up and distributed among family or sold through an estate service? But wouldn't they be sentimental enough to want what they didn't know was there? Or did they know? I don't think so. Should I try to find them, using what little information was in the jewelry box (initials and such) or should I return it to the store? Or should I keep it? Sell it? I became a bit preoccupied with finding out about this man and his family that night. Searching online for bits and clues and hoping to find who I think might be him. What would you have done? I'll tell you the rest tomorrow. You won't believe what happened next. I had a bit of help as I stitched little skirts for a craft show next weekend. She's a bit of a novice, but she's very calm and collected. Can you see her? I haven't blogged in some time. I've been lacking inspiration and the confidence to keep going. 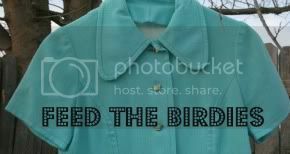 But Feed the Birdies is a second home for me...and I wrote it in chalk on my wall yesterday...and I sit here crafting tonight...and out comes a post. I have lots to catch up on, so I might make this a regular thing. What do you think? My friend and I have a booth at a fall craft show coming soon, and I have a big pile of magazines on my table, with paper-clipped pages and dog ears and notes wedged in the pages. Pages and pages. So many ideas that I can't seem to wrap my head around all the ideas that I have. I've always been a reader and a life-long learner and a scavenger of ideas that are new and improved. About anything. Well, almost anything. Along with that comes a busy momma that squeezes in as much as she can at every minute of the day, dragging along a little girl and presenting previews to the man on the couch, interrupting his time on the sofa with Stephen Colbert. I'm pretty high strung. Always have been. I remember sitting down at the table with one hand ready to push me back up as soon as I shoveled in my food... and not having the patience to write a full letter... and running out the door, a hurried mess, late as always, but sure of my destination and sure of my goal. They don't know that, though. I smile all the time. All the time. It's a good mask sometimes and it's for real sometimes too. The ones that are closest to me know that. The ones that don't sometimes wonder what I'm up to until they figure out it's just who I am. I'm not very organized, and I've learned that as I get older, it's necessary that I learn to be. I can keep a calendar. I love journals and papers and anything to write with, so I might have three calendars instead of just one. That's an issue. Ha. Organization might be the key to helping me slow down...I fly by the seat of my pants and thrive on spontaneity. It's the need for speed. However, I've figured out how to slow down now, and how to focus on the task at hand, and that if I really put a lot of effort into one idea, just this one time, my work turns out beautifully, and my spirit soars with pride that I started a project and finished it, and that it didn't become another stone in a graveyard of "someday" or saved or hoarded supplies that end up nothing but clutter. It's nice to slow down and see the big picture come to life. It's nice to pick a few things instead of a hundred and show off pretty things. Sometimes I see it in my head and then I don't see it again. And then sometimes I see it in my head and I see it in front of me ...an idea out of the stack...I did it. I outwitted the busy body and I was able to just be in the moment. Deep breath in....and out...and totally aware of it. Brady: Hey, mom...we brought Katie to the fair and my friend won a fish and gave it to Kate. And she's attached to it. Me: Ok, son. She can keep it. Me: What's it in? A bag? Brady: Yeah, he's in a ziploc bag. Me: (laughs to self) OK, son. Go to WalMart and get a small bowl. And some food. Brady: OK. A bowl? OK.
Brady: Hey, mom...now she has two fish. We got one out of Papa's fish tank. Me: Oh, gees, ok, son. Are they in a bowl? Brady: Yeah. We have them in a bowl. We put a piece of cardboard on top and she's got a SpongeBob, a Patrick, and a Sandy in there too. So we have two fish now. Goldie and Marlin. Imagine that. I must tell you about the Dr. Seuss fish. Later. P.S. The fishies didn't last so long. The kitties had fun. Oops.